Did you ever think about whether or not you have a genealogical superpower? It's a question that we toss out when we interview researchers for a spotlight over on our Genlighten.com site and it's one that I've been thinking about recently. I'd like to think that I do. 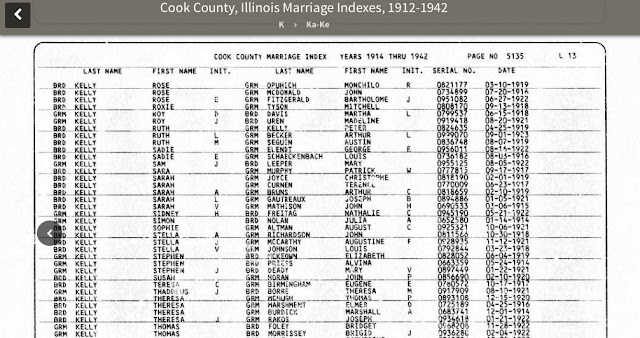 I'm pretty good at finding Chicago-related things at the Wilmette Illinois Family History Center--I can usually pull badly misspelled index entries out of the Illinois Statewide Death Index and there have been a few occasions when I've found Chicago death certificates that just didn't seem to be there--and people are always saying, "Ask Cyndy. She'll know." Truth is, though, I don't have all the answers and I don't have any superpowers at all. When I am able to help people with tough research questions, it's just a matter of having learned what records are available and what information they generally include. A person looking for an early birth date for Chicago who wasn't familiar with all of the available resources would check the birth index, right? It's the logical approach! But someone who's used the records at the Family History Center extensively might also check the birth registers, the delayed birth index, church baptismal records, and maybe even Chicago Lying-in Hospital records. 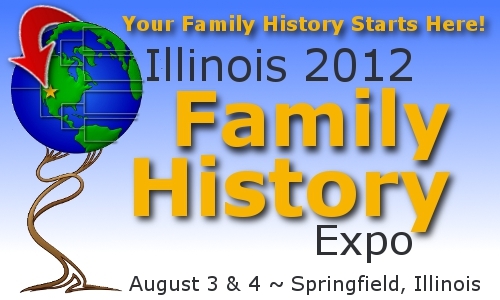 So what does this have to do with the Illinois Family History Expo in Springfield? Well, it seems to me that spending a couple of days attending lectures by folks who are knowledgeable about their speaking topics is good way be exposed to new resources and new ideas and that seems like a good way to boost our research superpowers. Case in point. A few years ago Dean went to a conference--I think it was National Genealogical Society conference, but I don't really recall--and brought home a thick volume of conference handouts. One day I picked it up and started reading. One of the lectures had been on United States passport applications--something I hadn't thought about. (They weren't yet on Ancestry.com at the time.) One of my most significant research finds--a photo of the woman I was researching--came about because of what I learned, albeit indirectly, from that conference. So, if you're interested in attending, I don't want you to find yourself saying, "If I had only known about that ... "
Arlene H. Eakle, Ph.D.--$300 research package. If you can make it, see you there! If not, I'll be blogging from Springfield, sharing some of the the superpower-enhancing information that I pick up from classes I attend. I'm psyched. I might come home needing to sew myself a cape. Last week I received an email inviting me to be a "Blogger of Honor" at the upcoming Family History Expo in Springfield, Illinois. In return for a number of perks including free conference registration, I would need to share information about the event beforehand, report on presentations and exhibits on the Friday and Saturday of the gathering, and wrap up with a post-conference summary of my experience. I gave it a lot of thought, and decided to give it a try. I've been to a number of conferences over the last couple of years, but I've always gone as an exhibitor for our website, Genlighten.com, and I've never attended classes. This will be a first! 1) What can I learn that might be of use to Chicago researchers? 2) What can I learn that might be of use to me in my own genealogy-related activities? 3) What can I learn that might help me better meet my clients' needs? As you can see, there's a wide variety of topic to choose from. 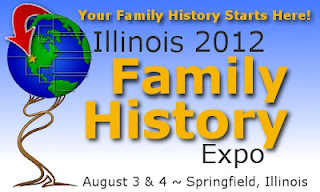 So, come August 3, I'll be hopping on a train in Chicago headed to Springfield for a new genealogy-related experience. Have you attended conferences before? Any suggestions for how to prepare? How to get the most out of the presentations? Is there a class on the list that you'd like me to report back on?